This was our first visit to the Kinloch Rannoch outdoor centre owned by Perth Council and it proved to be very well equipped with a good drying room and a massive flatscreen TV in the living room – Ron eat your heart out. 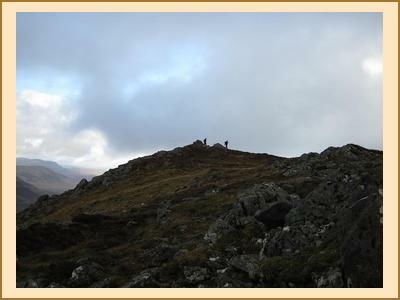 On Saturday, Ian and Allan S headed away early for Beinn Mholach. The rest of us opted to put off going out in the rain for as long as possible and much of Saturday morning was spent reading the papers and watching the rugby World cup semi finals. Comfortable as the bunkhouse was, a few hills would have to be done at some point. After lunch Alison W, Mike, Fiona, Tim and Kenny decided to do a traverse of the Corbett behind the hostel – Beinn a Chuallaich. Nigel, Eileen, Bill C, Fiona C and I went for the Graham, Meall a Mhuic behind the campsite at Loch Rannoch on the basis that it involved a sheltered walk in the forest for a substantial part of the route, following the right of way, Lairig Ghallabhaich. Nigel kindly volunteered to drop the Corbett party off at the start of their traverse before we headed off to the Graham. This meant two trips and a puncture on the second trip. So the late start for the Graham baggers became even later despite Nigel’s speed at repairing his puncture. Fiona M arrived on Sat night via a very wet ascent of the Sow of Atholl where she found a real pig’s trotter on the summit - lovely. The forecast for Sunday was substantially better. Allan S and Ian did the Corbett behind the hostel. Alison W and Fiona C cycled round Loch Rannoch. Fiona M and I were successful in finding dry rock and sunshine at Dunkeld. 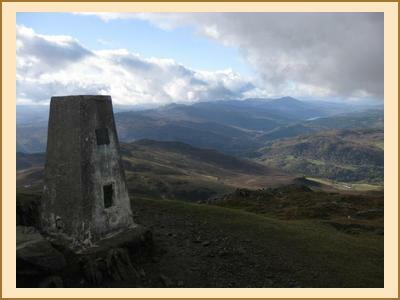 Kenny went up Birnam Hill and found that the view to the Rannoch hills is now blocked by a large windfarm. Nigel went up Ben Vrackie. Tim, Fiona R and Mike did the two corbetts Stob an Aonaich Mhoir and Beinn Mholach, reporting much boggy ground between the two. Loch Rannoch was definitely a good venue for this time of year with some lovely autumn colours and some less frequented summits for the club.